The use of large-calibre cannon continued into the First World War, although mainly on a small scale or experimental basis, with two principal uses in mind: downward firing, against ground or naval targets, and upward firing, against airships. In either case, this meant that the guns were rarely fixed to fire forward, being either flexibly mounted and fired by a gunner, or fixed to fire upwards or downwards. These planned uses also meant that rate of fire was not particularly important, so the development of automatic weapons had a low priority and almost all of the guns which saw service were manually loaded. Throughout the war, the lighter-than-air dirigibles of the Zeppelin and Schiitte-Lanz types, in which Germany had a massive technical lead, had a vastly greater range and load-carrying ability than aeroplanes and were perceived as the major threat in long-range reconnaissance and bombing missions. Initially, they also had a better climb and altitude performance and could often climb away from attacking aircraft despite their low maximum speed. This led to the development of specialist anti-airship armament, designed to exploit their Achilles' heel: the huge volume of highly inflammable hydrogen which kept them aloft. While some use was made of rockets, large-calibre cannon firing incendiary shells were the preferred weapons. 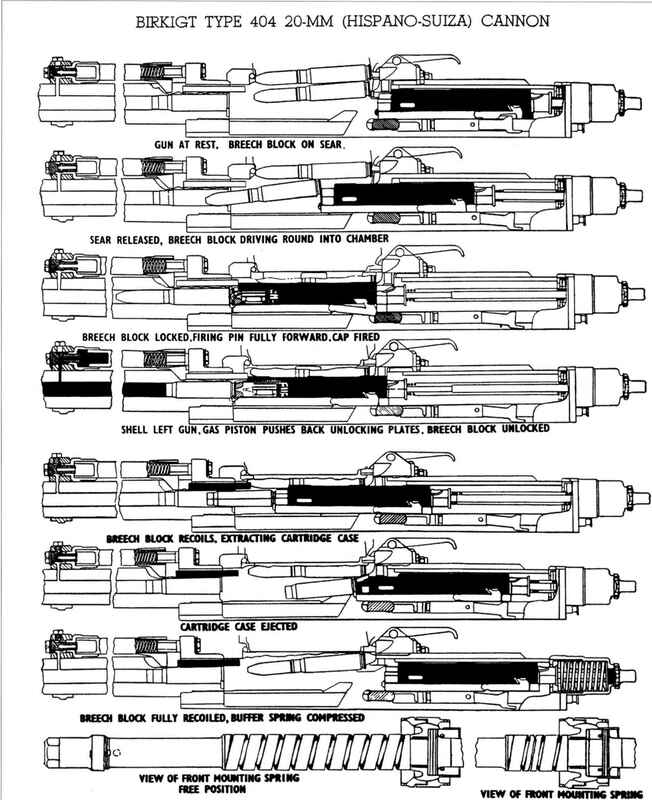 These could not only carry far more incendiary material than rifle-calibre projectiles but were more effective at tearing open the airships' envelope to enable the gas to escape - a necessary precursor to setting the craft alight as the gas would only burn in air. The British devised a highly sensitive nose fuze, the No. 131, designed to be detonated by passing through airship fabric. Some of the weapons were mounted so that they could fire upwards, a precursor of Second World War night-fighter tactics. Most of the large-calibre cannon developed during the First World War are of peripheral concern here because they were not fully automatic. At best they were semi-automatic (which in artillery terms means that the fired cartridge case is automatically ejected after firing, but the new round has to be loaded by hand) but some required manual opening of the breech as well, and were thus painfully slow and awkward to use under combat conditions. The most common calibre in the manually loaded cannon was the ubiquitous 37mm, usually firing the standard 37 X 94R Pom-pom cartridge, although in some instances more powerful rounds were used; e.g. the early French experiments with an adapted version of the naval Modele 1902 Tube-Canon1, designed for fitting in large-calibre guns for sub-calibre training purposes, and chambered for a unique 37 X 201R cartridge. Larger calibres were also tried, particularly by the French, who were quite enthusiastic about large-calibre cannon. They made some use of 47mm guns (created by dismantling surplus Hotchkiss rotary cannon) and the Germans experimented with guns of up to 130mm, but the heaviest conventional cannon fired in action appears to have been a 66mm flying-boat weapon used briefly by the Austro-Hungarians against light naval vessels. In 1917 the French specified a 75mm cannon in a flying boat, which was tested post-war.